UFC president Dana White puts to rest the welterweight title picture where he says Colby Covington is definitely next for new champion Kamaru Usman. A second round knockout from Jorge Masvidal last weekend over Darren Till definitely puts him higher in the rankings but he’s not leap frogging his good friend Colby Covington for a title shot. That’s the word from UFC president Dana White, who shot down the idea that Masvidal or anybody else in the welterweight division is going to jump over Covington. 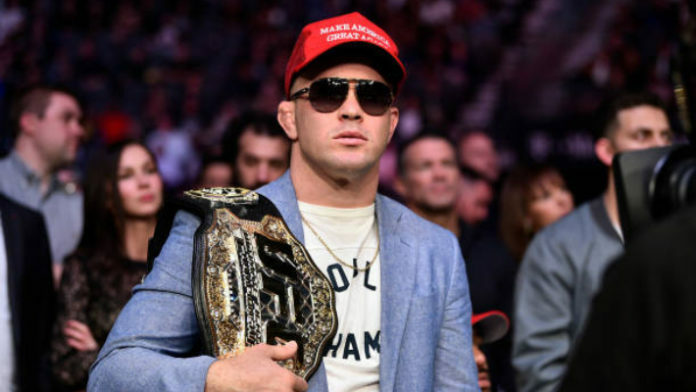 According to White, the plan remains the same with Covington getting the first crack at new welterweight champion Kamaru Usman once he’s healthy after just recently having hernia surgery while also recovering from a fractured foot. Following Masvidal’s win last weekend, Usman’s manager Ali Abdelaziz suggested that potential championship fight after such a dramatic knockout against a former title contender in Till. While he may get the opportunity down the road, White doubled down on Covington as the next contender for the title. “Masvidal just looked great. He just came off two losses then has a big win over [Darren] Till,” White explained when speaking to Yahoo! Sports. “When Usman jumped over Colby Covington, he was on a win streak, looked incredible against [Rafael dos Anjos], who I respect. Masvidal definitely did himself a huge service by getting the emphatic win over Till, which did help him bounce back from two straight losses to Stephen “Wonderboy” Thompson and Demian Maia. While he may not be getting a title shot, Masvidal has definitely put himself into position to receive a marquee opponent in his next fight. As for Usman vs. Covington, there is still no timeline set for that fight until the reigning welterweight champion recovers and can then set a date for his return to action. Covington has suggested a summertime showdown in June or July but until Usman is healthy, nothing will be scheduled officially.